National Review Online asked a group of experts: "There is rioting in Sudanese streets calling for the death of a woman over a teddy bear named Mohammed. What can we in the West possibly do with this — nationally, individually? How do we help? What must we learn from it?" For all replies, see "Symposium: Not Child's Play"
The mob demanding the execution of Gillian Gibbons — for allowing her seven-year-old pupils to name a teddy bear Mohammed — may have been government-prompted. In any case, it represents the latest example of one type of Islamist aggression. Most Muslim-majority countries have rules against insulting the Islamic prophet — most notoriously, clauses 295 and 298 of the Pakistani penal code. Islamists capriciously use such laws as a weapon to hound free-thinking Muslims and non-Muslims. In 2002, for example, 105 persons were killed in riots in Kaduna, Nigeria, following the publication of an article suggesting Mohammed would have approved of a beauty contest. At this very moment, mobs are howling in India for the death of Taslima Nasreen, the Bangladeshi author critical of Islam. Statements coming out of the West, from the Salman Rushdie affair in 1989, to the Danish cartoons, to Pope Benedict's speech in 2006, have inspired multiple violent eruptions. 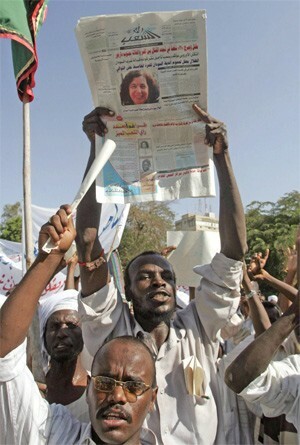 A Sudanese demonstrator in Khartoum holds a copy of "Ash-Sha`b" newspaper, calling for punishment against Gillian Gibbons. There were concerns for Gibbons' safety in Sudan after thousands of Sudanese, many armed with clubs and swords and beating drums, burned pictures of her and demanded her execution during a rally in Khartoum on Friday. She was moved from the Omdurman women's prison to a secret location after the demonstrations against her, her lawyer said. There was no overt sign that the government organized the protest, but such a rally could not have taken place without at least official assent. Sudan's ambassador in London, Khalid al-Mubarak, insisted Monday that the demonstrations ‘"were an argument from the fringe." Hundreds of Muslims took to the streets of Khartoum the day after she was sentenced, some of them calling for Ms Gibbons' death. The influential Council of Islamic Scholars in Sudan warned the Government not to free Ms Gibbons early, saying that the sentence was already too light and to free her now would "wound the sensibilities of Muslims. If the Government retracts this judgment . . . this would be a very bad precedent and it would have very bad consequences on the reputation of the state . . . not only in Sudan but also outside Sudan," said al-Sheikh Mohammad Abdel Karim, a spokesman for the council. "This is not a matter to be settled politically. This is a matter which goes to the very core of Muslims and their sensibilities." 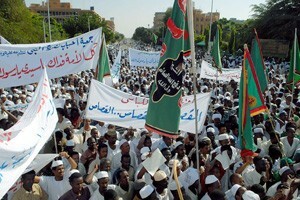 Sudan enjoys difficult relations with Britain, the former colonial power. Analysts had warned that President al-Bashir faced opposition within his own Government - from the powerful Ministry of Interior and state security apparatus - if he was seen to be bending to Western pressure. Elteyb Hag Ateya, a director of Khartoum University's peace research institute, said that the Government was keen to limit damage from the affair. "Whenever I speak to anyone in government they say it is a nightmare and they do not want to hear about it again. They do not want any aftermath like the lady going home and holding a press conference complaining about conditions."